Britain's last lion tamer, Thomas Chipperfield, was recently refused a licence to continue performing with his two lions and one tiger. The decision – which Chipperfield intends to appeal – marks the end of a long tradition of lion taming in Britain. It reflects a gradual shift in public attitudes towards circuses and a growing sense that making wild animals perform unnatural tricks is both dangerous and cruel. While it has taken nearly 200 years for such views to result in a formal ban, these sentiments have been around for a long time. From its origin in the early 19th century, lion taming has elicited both awe and horror. It has also attracted a socially diverse range of tamers, whose performances have been both praised and condemned. The first lion tamer to make it big in the UK was Isaac Van Amburgh. Born in Fishkill, New York State, Van Amburgh toured Europe between 1838 and 1845 and achieved notoriety for his performances with big cats. His act included introducing a lamb into the lions' cage and inserting his head into the mouth of his largest lion. Queen Victoria, a big fan of Van Amburgh, commissioned a famous portrait of the lion tamer by the artist Edwin Landseer. Though many were impressed by Van Amburgh's bravery, his performances also elicited criticism. When the American floated the idea of taking his largest lion up in a hot air balloon, the authorities banned the venture, persuaded that "if loss of life" were to occur without "even the shadow of a scientific pretext, it will certainly entail responsibility of a heavy kind upon all the parties concerned in so absurd an exhibition" (Morning Chronicle, September 24 1838). Reviewing one of the lion tamer's performances in 1838, meanwhile, a journalist for The Examiner objected to "the thrusting of his head within the lion's jaws", which was "at once a piece of gratuitous impertinence towards the animal, a very disagreeable exhibition for the spectators, and above all a highly hazardous proceeding for the exhibitor". Some level of peril was acceptable, and gave lion taming its thrill value, but excessive risk drew public condemnation. Soon a new trend swept the menagerie business: the phenomenon of the female lion tamer. Eager to ratchet up the tension of the lion-taming spectacle, menagerists searched for innovations in personnel and homed in on the idea of a "lion queen". The first lion queen, a Miss Hilton, had entered the lions' den at Stepney Fair in 1839, and was soon followed by others. By the late 1840s, having a female tamer on the staff was virtually a necessity for any self-respecting menagerist. Needless to say, not everyone was comfortable with the idea of letting a woman perform with wild animals, and the lion queen craze subsided in 1850 when tamer Ellen Bright was killed by a tiger in Kent. According to witnesses, the accident happened when Bright, who was only 17, was coming to the end of her final performance of the evening. The Daily News reported that wanting to perform a trick with the lion, she pushed the tiger out of her way, striking it "slightly with a small whip that she carried in her hand". The animal "growled, as if in anger", and immediately tripped the girl with its paw, "seizing her furiously by the neck, inserting the teeth of the upper jaw in her chin, and in closing its mouth, inflicting frightful injury in the throat". This shocking incident precipitated a flurry of impassioned protests against lion queens. One commentator, a journalist from the Stamford Mercury, eulogised "the graceful attractions of Miss Bright" and deplored "the folly of allowing so perfect a form to be thus exposed to ruthless hazard" through her "ill-advised tampering" with "caged monsters". Another, writing in The Morning Chronicle, denounced lion taming as a futile and brutalising spectacle that "degrades both the exhibitor and the spectator and hardens the nature while steeling it to fear and to pity". Once again, the motives of both performers and spectators were under scrutiny, triggering a bout of national soul searching. Another common critique of lion taming – even in the 19th century – was the cruelty it inflicted on animals. 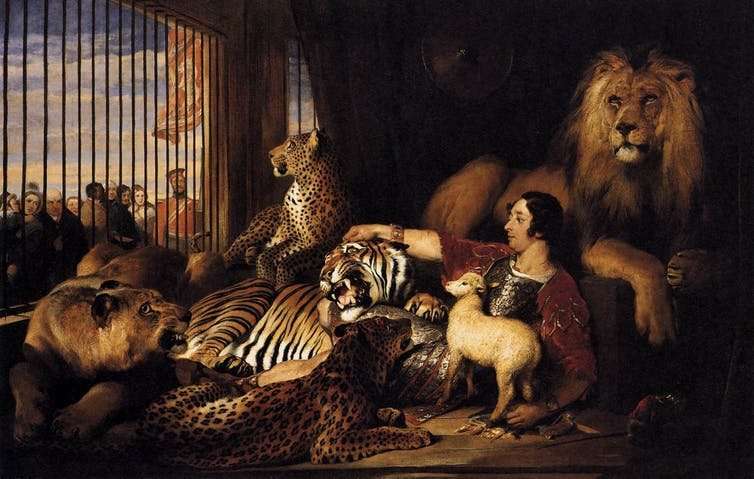 Van Amburgh used violence against his big cats, hitting them with a crowbar to make them submissive. Rumours also circulated that he declawed his lions and had their teeth filed. Writing in 1881, the RSPCA denounced all lion taming performances as "an exhibition of successful cruelty" in which "big animals are punished into sulky obedience or are made to howl with anger". One particularly shocking case of animal cruelty occurred in Leeds in 1874, when, as the Leeds Mercury reported, keeper Frederick Hewitt forced a group of hyenas to jump through a fiery hoop "saturated with naptha and then lighted". Many of the animals were "severely burned". Others exhibited "raw wounds … from which blood oozed". The RSPCA prosecuted Hewitt for the abuse, calling for an end to such performances. Though the case was dismissed on a legal technicality it paved the way for other successful prosecutions involving circus animals. Nor was it just animals that showmen were accused of exploiting. In addition to women, non-European, underage and disabled people also acted as tamers, drawing criticism from contemporaries. In 1866 magistrates in Nottingham denounced the performances of a five-year-old boy, Daniel Day, who entered the lion's den in his father's menagerie. And in 1870 concern was expressed for "a dwarf named Tommy Dodd", who performed with lions in Aberdeen. Then in 1872, outrage ensued when one-armed tamer Thomas McCarty was killed by lions in a menagerie at Bolton. While the chance to perform with lions may, in some respects, have been a liberating (and financially rewarding) experience for socially disadvantaged tamers, many saw the practice as voyeuristic and exploitative and called for its end. But despite surges of anger following serious accidents and deaths, the lion taming act survived public opposition, attracting large audiences well into the 20th century. It has only been in recent decades that its popularity has faded, thanks, in large part, to a rise in animal welfare activism.